What Is a Dry Eyes Relief Mask? The most common reason for dry eyes is oil glands that get blocked, called Meibomian Gland Disorder (MGD) or Blephiritis. Patients are able to get relief at home by using a warm compress to loosen up the oil glands. 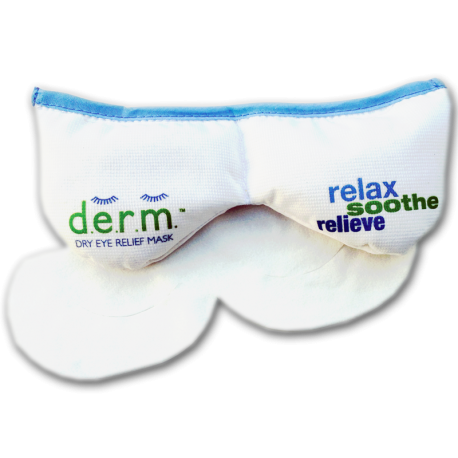 The Dry Eye Relief Mask is specially made to retain heat where it matters most. Using Silica beads that are microwaved to the right temperature, the mask is hypoallergenic and a cost effective solution to your dry eyes. What To Patients Say About the d.e.r.m mask? I felt immediate relief from the derm mask! You just moist a towellete or papertowel with the derm mask in microwave about 20 seconds. Place over eyes for about ten minutes. Its very relaxing and your dry eyes feel much better. How does the Dry Eye Relief Mask Work? Place in a microwave on high for 20 seconds (under 1000w may need to adjust the length). For mild dry eyes wear for 7-9 minutes, for more severe dry eyes 10-20 minutes. After finishing treatment, leave the mask to air dry. Can be used with many different causes of dry eye, such as itchy eyes or eyes that are dry due to menopause.